Iowa State scientists have developed a working battery that dissolves and disperses in water. Scientific illustration by Ashley Christopherson. If you’re a fan of the Mission Impossible film franchise, then you’re familiar with one of the spy movie’s classic tropes: the self-destructing secret message. It’s hard to believe that self-destructing electronics, with their myriad military applications, don’t already exist in the real world. But as researchers in the emerging field of “transient electronics” know, it’s not so easy to build a true self-destructing device—one that can perform a function and then, when triggered by light, heat, or liquid, completely disappears. But a group of researchers from Iowa State University have had some success. 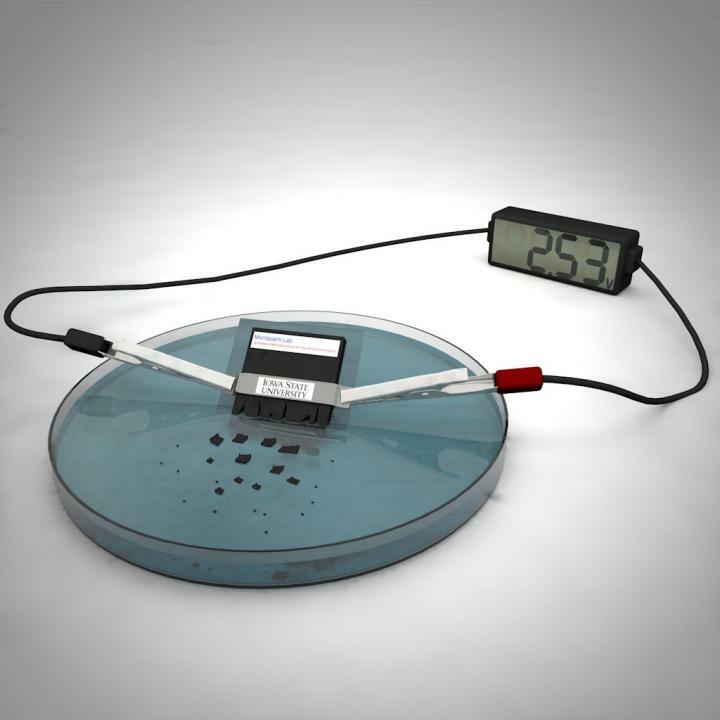 They’ve developed the first self-destructing, lithium-ion battery capable of delivering 2.5 volts—enough to power a desktop calculator for about 15 minutes. The battery’s polyvinyl alcohol-based polymer casing dissolves in 30 minutes when dropped in water, and its nanoparticles disperse. Unless your calculator contains secret messages, there’s still no way to live out your Mission Impossible fantasies yet. But Reza Montazami, assistant professor of mechanical engineering at Iowa State University and lead researcher on the project, says a self-destructing electronic device with military applications is on the horizon, now that DARPA has started to fund more research in the field. He discusses the implications of a successful self-destructing battery on the future of transient electronics. Reza Montazami is an Assistant Professor of Mechanical Engineering at Iowa State University in Ames, Iowa. IRA FLATOW: This is “Science Friday.” I’m Ira Flatow. Imagine you’re a spy who has been captured carrying a device full of classified military data. If the bad guys get a hold of the information, well, you know what can happen. But what if the device that stored that data could dissolve in water at a moment’s notice, like an Alka Seltzer tablet? That is the dream of a group of researchers in the emerging field of transient electronics– to create devices that self-destruct for the purpose of keeping military secrets out of enemy hands or devices that dissolve in your body after their useful life is over. So get used to that term– transient electronics. You’re going to be hearing a lot more of it. Unfortunately, scientists and engineers are still a wee bit away from developing something as sophisticated as a dissolving hard drive or a smartphone. But researchers from the University of Iowa are at least one step closer. They have successfully created a lithium ion battery that could one day power some of those potential devices. And Reza Montazami is here. He’s assistant professor of mechanical engineering at Iowa State University. Welcome to the program. REZA MONTAZAMI: Thank you, Ira. Great to be on the show. IRA FLATOW: Tell us about this. Let’s start from the beginning. What are these things called transient electronics? REZA MONTAZAMI: They have a pre-defined and well-designed life span. Unlike conventional electronics that are usually built to last a very long time, transient electronics are designed to perform a specific task over a given period of time. And the hope is to make it disappear after that period of time is over. IRA FLATOW: Well, why don’t we just blow them up like we do things now? REZA MONTAZAMI: Well, that is one option. Of course, if you are working with bioelectronics or biomedical devices, you don’t want to [INAUDIBLE] up in someone’s body. So that is one drawback, because you may also hurt the person who has this piece of electronic in their body. And also, when you blow up something, or if you, for example, break something or shatter something into pieces, there are going to be some remains, or at least there are going to be some signs of that explosion or whatever mechanism that triggered that destruction. In case of transient electronics, the hope is not to leave anything behind. So once you piece of electronic is destructed, the hope is that if someone goes to that site, they won’t know that there was a device here. IRA FLATOW: So you’ve taken the first step. You’ve redesigned the lithium ion battery so that it self-destructs in, what, 30 minutes? REZA MONTAZAMI: Yes, approximately 30 minutes. IRA FLATOW: So what kind of engineering does it take for that? Do you have to just adapt a current lithium ion battery, or do you have to start over from scratch? REZA MONTAZAMI: Both are possible. Actually, there are versions of transient batteries that use a different chemistry than lithium ion batteries’ chemistry. But usually, the output potential, the voltage is lower, because you’re using a different sort of [? salt ?] and ions, so it undergoes a different chemistry and delivers a different voltage, which is usually lower, has been obviously lower. What we did– we tried to work off the conventional active materials in a lithium ion battery. So for example, the material we use for our [? cation ?] and [? electrolytes ?] are very similar to those in your cellphone battery or your laptop battery, any other lithium ion battery that you may find in the market. We took those materials and took their chemistry to make them transient. And these materials are not water soluble by default, so we had to come with a new approach to what we call the hybrid chemical physical [? transient ?] approach, which takes advantage of some soluble materials and some insoluble materials that are deposited from either a nano or a micro dispered solutions, and then the particles are redispersed in the solvent– in our case, water. So some of the components don’t actually dissolve, but they are redispersed in the form of nano and microparticles. IRA FLATOW: So does it self-destruct, or do you need to drop it in water? REZA MONTAZAMI: You need to drop it in water. And self-destruction is our next step, something that can be remotely activated. That’s the next step. IRA FLATOW: So the idea would be to create a device that, when it’s self-destructs, you don’t even know it had been there in the first place. REZA MONTAZAMI: Yes. Yes. That’s the general idea. IRA FLATOW: How close– do we have an application for your first battery, how to use it? Is someone paying to say, hey, give me one of those. I know how to make something out of that. REZA MONTAZAMI: Well, the research is at the fundamental stage. So we are mainly are trying to just learn and hopefully master this technology. The applications will come after this stage. Basically, the engineering would happen after we have mastered the technology. Because for a device to be fully functional, there are many working components. One of those components is the battery that provides the source of energy. About two years ago, we had a transient antenna that could receive a radio signal, but then it was connected to other non-transient equipment in our lab. So it was just the antenna that was transient. So that was the first step. So in order to have something that is fully functional and basically self-sustaining, there’s a long way. IRA FLATOW: I’m sure the military is interested in this, for obvious reasons. Have you had any work with them or heard from DARPA? Have people heard from DARPA that they would like something like that? REZA MONTAZAMI: No. Actually, DARPA had two calls for this type of technology. The first call was one of the fundamentals. That was basically before we started working on this, or [? probably ?] that was at the same time, so we didn’t have enough preliminary data to submit a proposal. The second call, which was last year, was on a a– if I remember correctly, on an airplane or a glider that can deliver a package or a parcel to a specific location and then dissolve, and then it only– as much as a tennis ball could remain at the site. And that is, again, more toward the application. Our approach is more toward the fundamental understanding and fundamental science of it. IRA FLATOW: So all the secrets in that glider or whatever would just go away with the dissolving of the object itself. REZA MONTAZAMI: Yes. The idea was that the glider itself was also– you can deliver a package or parcel to somewhere, and then your delivery mechanism is disappearing. IRA FLATOW: Wow. Fascinating. We’re going to add that phrase to our vocabulary– transient electronics. We’ll be watching out for you, Reza. Thank you for taking time to be with us today. REZA MONTAZAMI: My pleasure. Thank you. IRA FLATOW: Reza Mantazami is assistant professor of mechanical engineering at Iowa State University. Wonderful, more nanoparticles in our oceans. The battery would have to be sealed so that humidity in the air wouldn’t dissolve it. The only application would be to ensure planned obsolescence. Open your computer? Your computer dissolves. It would be just like the strip in an iPhone that changes color when the phone gets wet except it wouldn’t just be a marker your phone would die. I almost can’t think of something worse for people who want to repair an item then this. Is ‘Brain Spyware’ In Our Future? An excerpt from "Future Crimes."